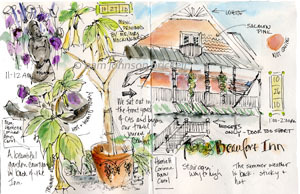 A few weeks ago I conducted a 3-day Travel Journal Workshop at Coastal Art Supply in Beaufort. We made 2 simple practice journals. One from a sheet of 18 x 24 Strathmore drawing paper, the other from a half sheet of Canson Edition paper. I wanted my students to feel less intimidated about making marks in their designated 'travel journals.' Practice, after all, is a wonderful thing. What better way to prepare making journal entries than in a journal - even one with just a few pages! They did a series of 3 - 10 minute sketches, then they worked on each sketch an additional 10 minutes adding color. Later that day, in the comfort of the classroom, they added type to complete their pages. Jobs well done! See, you can sketch quickly with pen and what great results! Below is day one's demo. A view of The Beaufort Inn and some of the garden's plants. Sometimes it's a hit or miss experience when doing a demo. This time I didn't get the proper proportions on the inn. Only very small people can enter this inn..... the first floor is way too short :) So, I make light of the ooobooo and move on. I've been through Beaufort but never stopped - may have to do that next time I'm in SC. This sounds like a wonderful workshop - your students were probably stressing but then realized the fun that could be had when doing things quickly and moving on. They were happy campers at the end, Rhonda! 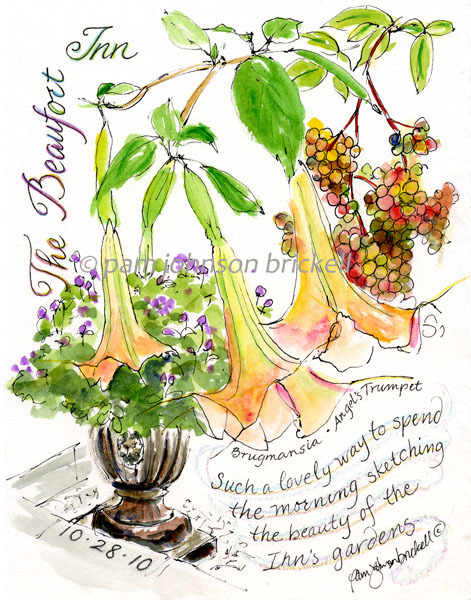 Beaufort is a treasure as is the Inn! Let me know when you're coming! 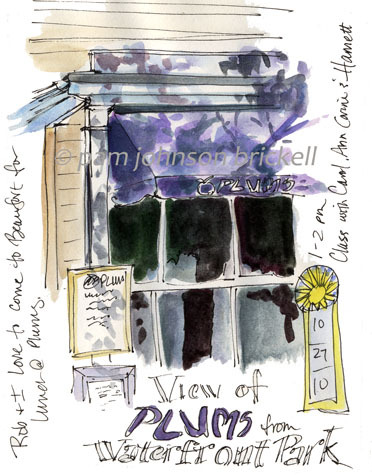 I was just in Beaufort for a 4 day watercolor workshop. A LOVELY town! 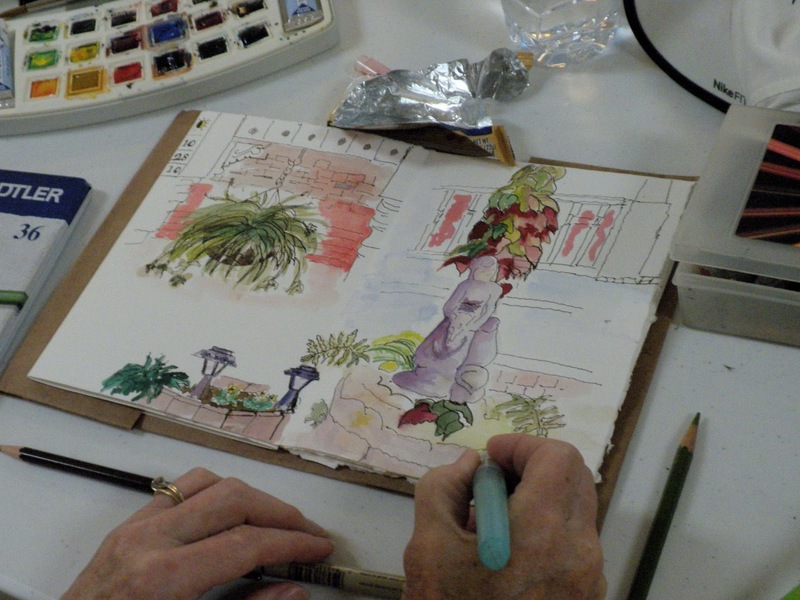 I visited the Coastal Art Store while I was in Beaufort and saw where you teach classes. Hopefully one day soon I will be able to take one of your workshops there! Great! You got to see Beaufort! I do love it there. CAS is a happy art store. I look forward to you making it over for a workshop! Looks like you all had such fun! I've been drawing with pen myself lately - it IS daunting but so freeing...I realized that a few stray lines don't make that much difference, and sometimes they add to the drawing itself. Any time I was moved out of my comfort zone by a teacher was the time when I learned the most! Way to go! It is up your alley :) Thanks for stopping by!